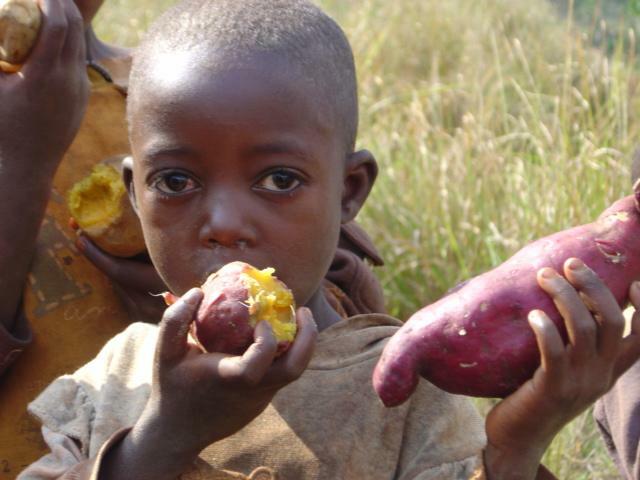 South African scientists worked under the umbrella of the Vitamin A for Africa partnership (VITAA) and completed what is believed to have been the first controlled study to establish the value of orange-fleshed sweet potatoes in battling one of Africa’s most important public health problems: vitamin A deficiency in young children. Lack of Vitamin A in the diet is a leading cause of early childhood death. The study, which involved primary school students between 5 and 10 years of age, showed that over a period of just 11 weeks, the proportion of children with adequate vitamin A liver stores increased 10% among those who ate high beta-carotene orange-fleshed sweet potatoes. A comparable group that ate only white-fleshed sweet potato experienced a 5% decline. Partner agencies from the health, nutrition and agricultural sectors, operating under the VITAA umbrella, agreed to work together to extend the new orange-fleshed varieties by 2005 in seven partner countries: Ethiopia, Ghana, Kenya, Mozambique, South Africa, Tanzania and Uganda. Similar studies are being considered for India.